Trees have arisen independently in a large number of plant families as a strategy which outgrows other plants in competition for light, and in so doing have evolved a large perennial woody skeleton to display, in a large tree, over half a million leaves. Such a tall structure is also a good platform for displaying flowers to wind or animal pollinators, and the height helps falling seeds to disperse further. These evolutionary trends have resulted in trees being the tallest and largest of all living things. The tallest trees in the world are currently the coastal redwoods of California (Sequoia sempervirens) at 115.5m (358 ft) although the tallest tree ever, a mountain ash Eucalyptus regnans in Australia, may have been over 150m (500ft) - see Section 1.3.1 above. California also boasts the largest tree, a giant sequoia Sequoiadendron giganteum growing in the Sierra Nevada Mountains, called General Sherman. The General is 83.8 m tall with a width at the base of 11 m, giving an estimated mass of2030 tonnes (by comparison, the blue whale, the largest animal, weighs only around 100 tonnes). and distinctive structure (Fig. 1.2). The outer bark on the outside serves a dual function as a waterproof layer (to keep water in) and a defence against attacking organisms. The cork cambium in the bark is responsible for the production of corky cells whose walls are suberized by fatty compounds which render them impervious to gases and liquids. The bark is punctuated by lenticels, however, which allow vital gas exchange. In the cork oak Quercus suber, which is extensively grown in Portugal and Spain, this outer layer grows so rapidly that a thick layer of cork, renowned for its use for wine bottle corks, can be stripped off every 8-12 years. 1 A difference of opinion exists over the correct scientific name. 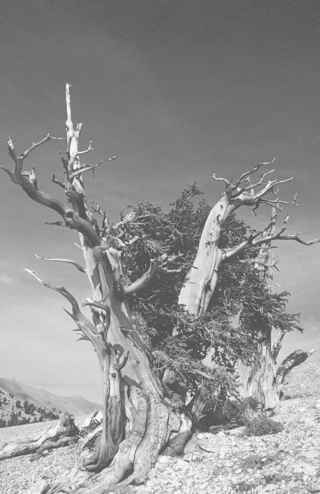 Americans like to call the bristlecone pine, Pinus longaeva. The World Checklist of Conifers (Welch and Haddow, 1993), however, calls it Pinus aristata var. longaeva. 4862 years at 3275 m on Mount Wheeler, Nevada. Since dead trees at this altitude decay so slowly, dendrochronologists have been able to cross-match the ring patterns of dead trees to the living trees and so create a chronology of ring widths extending back almost 9000 years. The xylem or wood is divided into the outer sapwood and the central heartwood. Water is pulled up through the water-conducting tubes of the sapwood while the heartwood is usually considered to be the main component holding the tree up. 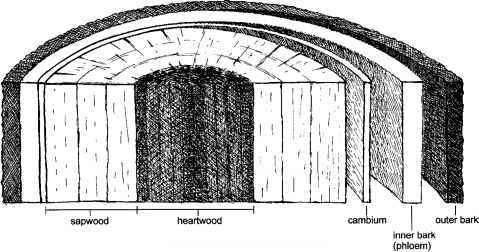 As sapwood is converted to heartwood, the proportion of heartwood accumulates with age, and is used by a number of organisms -animals, bacteria and fungi - as a food source and habitat. While this appears detrimental to the tree, wood is remarkably resistant to decay and contains barriers severely limiting the spread of rot (see Thomas, 2000). Moreover, heartwood rot may in reality be beneficial since a number of trees are able to grow roots down through the rotting wood to absorb nutrients released by decomposers, and so in effect recycle themselves to gain a competitive advantage over solid neighbours. Hollow trees are also somewhat better at resisting strong winds as was demonstrated in southern Britain in October 1987 when 15 million trees blew down in gusts of up to 122 mph (196 kph); a large proportion of the oaks left standing were hollow. If the tree becomes too hollow, however, the trunk may physically collapse, losing the tree its place in the canopy even if it regrows from the remaining portions. So despite the advantages ofbeing hollow, energy is invested in controlling the rot, reaching a compromise. The woody skeleton is a liability to the tree in another way. The tree grows by adding a new layer of wood underneath the bark every year, which, like putting Russian dolls together, inevitably must be bigger than the previous year's layer. Thus, the expense of growing the new layer, and its upkeep in terms of respiratory burden, grow larger each year. 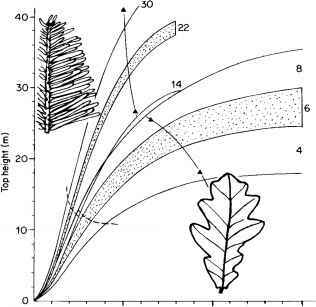 At the same time, once the tree reaches mature size, its photosynthetic capacity becomes fixed since only a set number of leaves can be held on its woody frame: while the tree's income becomes fixed its outgoings escalate year by year. Inevitably, portions of the skeleton die. These dead branches, normally at the top of the tree, added to those branches lower down that die from being increasingly shaded as the tree and its neighbours grow, create a reservoir of dead wood utilized by a number of invertebrates and vertebrates. As will be seen later, normally a quarter of the biomass in a natural forest is dead wood. The root systems of most trees are shallow (usually no more than 2 m down) and wide spreading, up to 2-3 times the width of the canopy as a norm. Conifers in northern forests have the shallowest rooting depths (80-90% of roots in the top 30 cm); most temperate and tropical trees have 26% of roots in the top 10 cm and 60% in the top 30 cm (Jackson et al., 1996). Deeper roots grown by some trees become important in forest subject to periodic drought. In a woodland, it is inevitable that roots criss-cross past each other, and will graft where they touch, especially if they are roots from the same species. Counter-intuitively, this is often mutualistic rather than competitive and allows trees to share resources. It is not uncommon that cut stumps with no foliage of their own will continue to grow in diameter, fed through root grafts with surrounding siblings (see also Section 2.3.1). Conversely, above ground, tree canopies do not usually intermingle but remain separate, referred to as canopy shyness. The primary reason is that as canopies sway in the wind, ends of branches clash and rub, breaking off buds and inhibiting growth in that direction. Trees create their own microclimate under the canopy; it is often darker, buffered against extreme temperature change and with a higher humidity. Different trees allow different amounts of light through the canopy due to variations in leaf density and degree of canopy shyness. This is also affected by the spacing of trees, influenced by soil conditions, water competition or external agents such as fire and wind. The percentage of sunlight that reaches the ground in summer can be as high as 20-50% in a birch wood, down to 2-5% under dense hardwoods such as beech, and even as little as 0.2% under a tropical rain forest. As a general rule of thumb, plants need 20% of full sunlight to grow maximally and at least 2% of sunlight for photosynthesis to match respiration needs (the compensation point). From this, it can be seen that forest interiors in summer are dark places for plants. We tend not to appreciate this because our eyes have irises that open to let more light in. The best way to see a forest from a plant's view is to rush headlong into a forest on a sunny day and for a fleeting moment before our eyes adjust, and as we trip over the first log we come to, we will appreciate just how dark it is. Or take photographs on the same exposure setting inside and outside the forest. The amount of light reaching the ground seasonally is also affected by evergreen and deciduous strategies (see Section 3.6). Evergreen trees, which keep their leaves/needles for several years, cast a deep shade all year round. Conversely, deciduous trees often provide a window of high-light conditions at ground level in the early spring and late autumn which is utilized by under-storey plants, discussed in Section 1.4.2 below. Evergreen species have to invest heavily in producing robust leaves that will survive harsh environmental conditions and the prolonged attacks of herbivores and pathogens. When their leaves eventually fall, they are usually hard, acidic and difficult to decompose, leading to a deeper litter and humus layer beneath.